Technology is Everywhere! (Learn what’s working and what isn’t) Technology is everywhere, and becoming more and more integrated in both our personal and professional lives each year. Whether you’re a high-end software company, a traditional retailer, or anything in between – you can reap the rewards of effective technology. You can realise cost reductions, make efficiency improvements and improve the overall competitiveness of your business. Tech events allow you to see which direction your industry is (and isn’t) moving in, allowing you to stay ahead of the curve. Develop your Brand’s Profile! Be seen as an industry leader and reach out to the organisers about the many speaking opportunities available at Tech events. Speak about what’s important to you, what the future looks like in your industry or how products or services like yours can help solve everyday problems for businesses. Use previous customer-wins and case studies to show how you’ve helped other recognised organisations, or showcase your partners through an interactive Q&A to answer the questions your potential customers would like the answers to, while also further developing current client and partner relationships. Interested? Apply to be a speaker here. Generate High Quality, Targeted Business Leads. Tech events are a great place for businesses to quickly expand their customer base and at a fraction of the cost of normal lead-generation. Invite potential clients to the event and organise to meet them during the programme. With delegates taking time out of their working week to attend an event, they are more likely to be motivated and interested in your business’ product or solution. Benefit from the many opportunities to meet new faces and further develop current client relationships at your designated exhibitor space. Use this area to show off your new product, or show how you utilise technology to ensure your customer is getting the best possible service/result. A successful show could keep your own business development team busy for months! Take a look at our overview pack to learn more. Meet New Talent. When you think of a Tech event it’s easy to think only of the chance to grow your customer base, but exhibiting can also be a fantastic opportunity to speak with quality delegates about the opportunities within your business. No matter what your business is, it still relies on brand perception. You may develop high-end Cloud solutions, or simply use software to track online sales, regardless of what you do Tech events are the perfect place to showcase the work that you do to potential new team members. Grow your Business Network. Tech events are a great opportunity to connect with people and organisations you may not normally come in to contact with during normal business activities. Developing a network beyond your industry can have exponential benefits to your organisation. Tech events are also the perfect platform to reconnect with old contacts, broker introductions between acquaintances and create new partnerships. 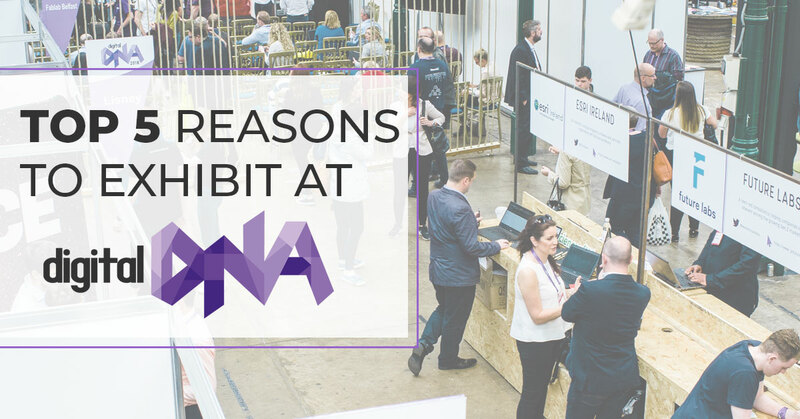 At events like Digital DNA, you never know who you could meet; from that next hire, to your next client, a new investor or even a business mentor, the opportunities are endless.